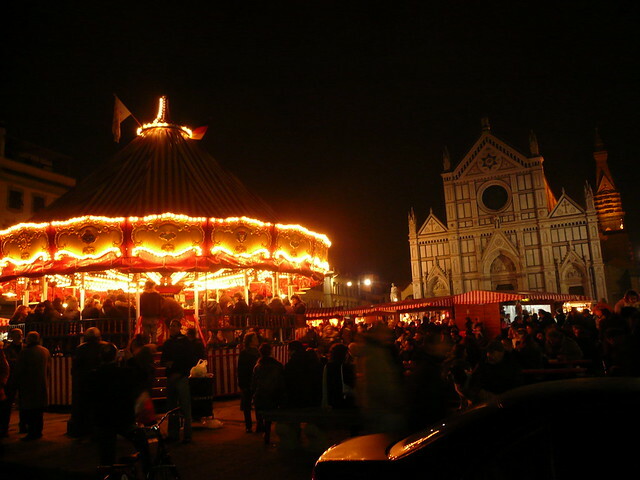 Piazza Santa Croce is ready to transform into a festive German village for the annual Christmas market. Think handcrafted trinkets, mulled wine, and Bavarian comfort food – a recipe to warm even the coldest of hearts! The market runs from November 28th til December 16th, every day from 10 a.m. to 8 p.m.
Italians start the holiday celebration fairly early, as early as December 8th in fact, to commemorate the Immaculate Conception. 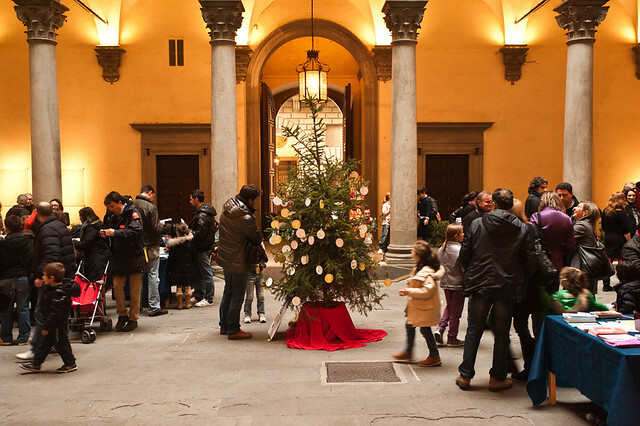 Head to Palazzo Strozzi between 3 and 5 p.m. for arts & crafts, family-friendly events and a hearty dose of Christmas cheer. Guests are free to enjoy the festive decorations and courtyard activities. Click here for all the details. The truth is you don’t need an event to experience the magic of Florence during the holiday season. We suggest you take our fashion walk, this time down Christmas-light-lit streets, and admire the incredible festive window displays. Rinascente in Piazza Repubblica often features creative, contemporary artwork in addition to lighting up the entire block with its pearly white brights – definitely a don’t miss! …the enchantment of it all is enough to make me book a ticket to Tuscany. Luckily, The Florentine (another favorite free resource!) tipped us off to free bed & breakfast stays in exchange for small services (much like wwoofing!). Click here to explore all your options. No matter how you choose to celebrate this holiday season, we hope your upcoming month is full of good cheer. Auguri!